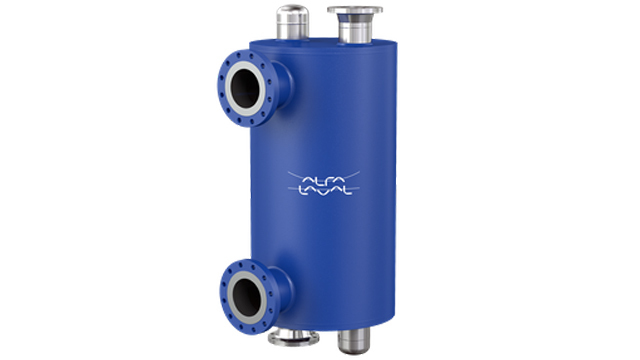 Alfa Laval DuroShell is a plate-and-shell heat exchanger specially engineered for demanding duties such as high pressure and high temperature applications. It incorporates many innovative features to optimize process performance. Heat exchangers are used in a wide range of demanding positions in the petrochemical industry. They meet the challenges that shell-and-tube and conventional plate-and-shell designs have problems with. Shell-and-tube heat exchangers have long been used in demanding positions gasketed plate heat exchangers can’t manage. But space is a scarce resource in power plants. Bulky shell-and-tubes require a lot of it as well as a large capital investment. Compact performance for the toughest demands – Alfa Laval DuroShell for marine thermal applications. DuroShell's robust design minimizes maintenance and maximizes uptime. The patented roller coaster plate pattern ensures exceptionally high thermal efficiency, while unique cut-wing plates allow for multi-pass design. The fully welded design allows for high operating pressure and optimizes resistance to fatigue. Distribution pipes run through the plate pack, relieving stress on the pack itself. DuroShell is a plate-and-shell heat exchanger with a groundbreaking internal design that offers improved efficiency and durability to maximize uptime, cut costs and increase production capacity. DuroShell's laser-welded plate pack comprises cut-wing plates and plates pressed with a patented roller coaster pattern that resists fatigue. The distribution tubes run through the plate pack on the plate side to further increase strength. The roller coaster pattern improves thermal efficiency by maximizing turbulence and minimizing fouling. The cut-wing plate design creates an open area on each side of the shell interior, allowing multi-pass arrangements for even greater efficiency. DuroShell withstands large variations in temperature and pressure, unlike conventional plate-and-shell heat exchangers. Corrugated plates tend to expand in just one dimension. DuroShell plates expand evenly in all directions thanks to their patented roller coaster pattern. No weak spots arise under stress means better resistance to thermal and pressure fatigue. The entire plate pack is reinforced by the distribution tubes, removing vibrations due to flow turbulence or phase change. Laser welding is used throughout, creating the most accurate weld with the least heat stress on surrounding material, further improving fatigue resistance. DuroShell operates with one media on the plate side and the other on the shell side. Both can be rated up to the full 100 barg (1450 psig). In a single-pass configuration the heat exchanger works in pure cross-flow. In a multi-pass arrangement the flow is equivalent to a global counter-current configuration. Distribution tubes extend through the plate pack to ensure even distribution of media across the heat transfer surface. Since the nozzles on the shell side are independent from those on the plate side, DuroShell is ideal for asymmetric flow duties.